NASA is trying to make progress toward a manned mission to Mars and, to that end, they are testing a cutting-edge spacecraft breaking system called the Supersonic Inflatable Aerodynamic Decelerator (SIAD). The same system was tested last year, when SIAD performed flawlessly. Its parachute, however, did not. Numerous improvements have been made to this year's chute - which will be the primary focus of this month's test. Viewers will see live images of the test, which will take place off the west coast of Kauai, Hawaii in the Pacific Ocean, taken by four on-board cameras. The launch, originally scheduled for June 2, but later postponed due to unfavorable ocean conditions, is slated for Wednesday, June 4, after 17:30 GMT. 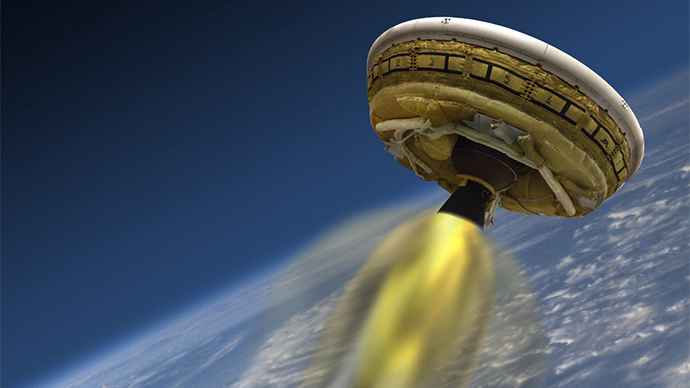 The flying saucer-like LDSD test vehicle will be lifted by a weather balloon to an altitude of 120,000 feet.NASA TelevisionandJPL's Ustream channelwill carry live commentary on the launch from 5:30 pm to 7 PM GST (10 am to noon PDT). Viewers tuning in will see the same images as NASA does in real time, according to Mark Adler, project manager for LDSD at NASA's Jet Propulsion Laboratory in Pasadena, California. "This year's test is centered on how our newly-designed supersonic parachute will perform. We think we have a great design ready for the challenge, but the proof is in the pudding and the pudding will be made live for everyone to see," he said.